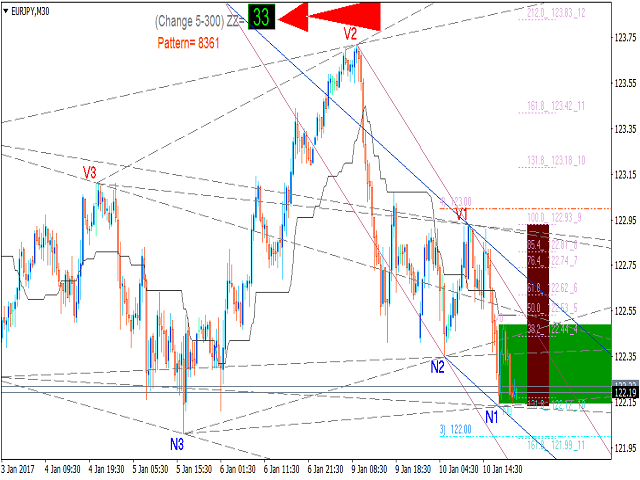 Control over the indicator is performed by changing only one parameter directly on the chart. Innovative and precise algorithm for plotting the ZigZag peaks. The "ProZZcom" indicator plots a graphical layout, which allows to quickly find the points for accurate entries and for placing short stop orders. 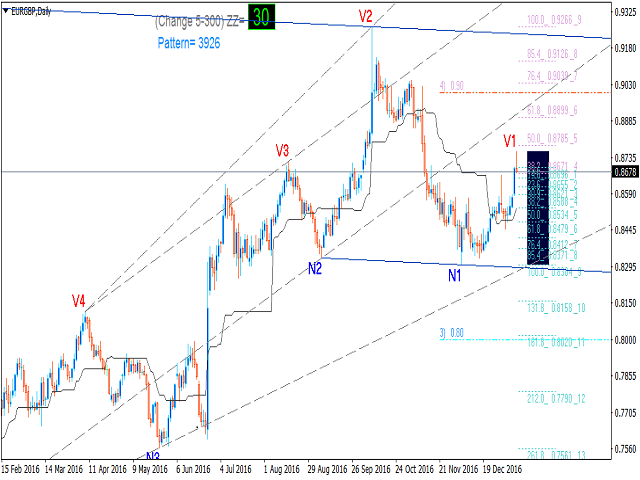 It also predicts a possible flat in the early stages, shows the trend direction and correction in the wave, draws the round levels, draws the Fibonacci level lines. The indicator works on any instrument and any timeframe. Adapted to 4- and 5-digit quotes. An indispensable assistant for those who monitor a lot of financial instruments. The indicator incorporates 15 years experience in the financial markets, it is compact and fast. Vertices of the zigzag legs are designated with numbers+letter, 4 top and 4 bottom. The calculation algorithm is designed in such a way that creating any more of them is meaningless. Draws only the important trend lines based on the zigzag peaks with the highest probability of price support and resistance (the 'TrendLineDraw=true/false' parameter in the indicator settings allows to enable/disable the function). Determines the pattern based on the available zigzag peaks and displays the valid pattern out of hundreds of possible options on the screen as 4-digit numerical code in "Pattern=ХХХХ". It is possible to use only the two last digits or even only the last one. Accordingly, a more simplified pattern will be received. Red font color and a value from 5 to 1 indicate a fall, while blue color and a value from 5 to 9 indicate a growth. 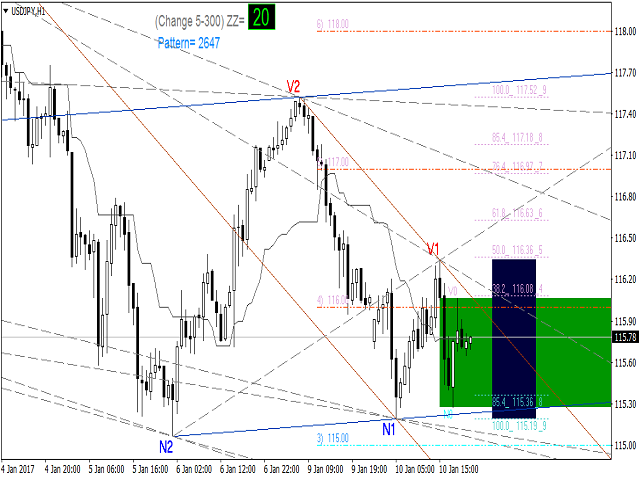 Displays the upcoming upper and lower levels for the possible reversals based on the Fibonacci levels. Shows surprisingly high probability of the flat. The appearance of the green rectangle on the chart warns about consolidation (flat). Large red rectangle denotes the N1 downward wave. 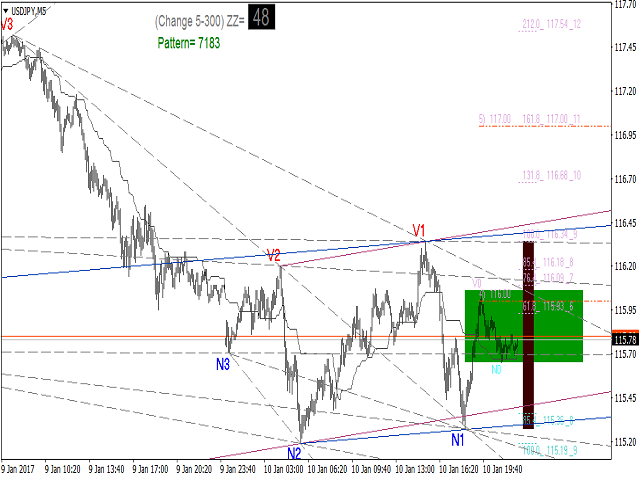 Small blue triangle on the background of the large red one will show a correction in the current N1 wave. Large blue rectangle shown the V1 upward wave. 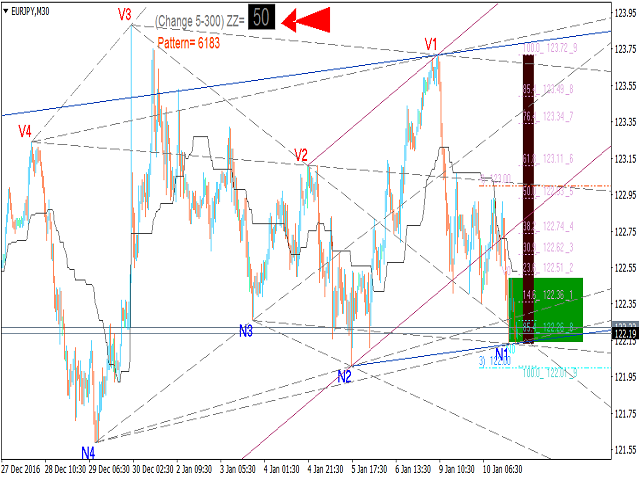 Small red triangle on the background of the large blue one will show a correction in the current V1 wave. To change the value of the indicator parameter, simply click edit box and enter a new one in the range from 5 to 300. There may be a warning about insufficient bars in history, but it is not a critical error, but the inability to calculate distant peaks of the zigzag. It should be understood and remembered that, unfortunately, the indicator cannot hold the price. It can only point at the important moments for making a decision. Therefore, protective stop orders should be set. It is recommended to apply additional filters for more accurate entries. Очень классный, грамотно (по всей трейдерской науке) написанный индикатор.